As a NET Practitioner I am nearly unlimited in my ability to address the physical and behavioral stress-related conditions of my patients. These conditions include headaches, body pains, phobias, general anxiety, self-sabotaging behaviors, organ dysfunctions and so much more. It’s important to note that NET does not cure or heal the patient, but rather, NET removes blocks to the natural vitalism of the body, “allowing” the body to repair itself naturally. 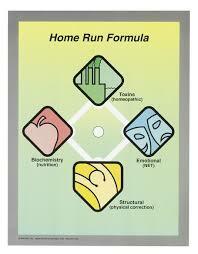 NET uses the Home Run Formula model as a way of categorizing health into four general areas. This model provides me with an innovative, yet time-proven method of analyzing and helping patients. I have been trained to use "The Home Run Formula" model, with 1st base representing Emotional/stress-related factors, 2nd base representing the effects of toxins on the body, 3rd base representing nutritional needs, and 4th base representing structural needs. Although stress to be a big component of health, it is very important to understand that any problem can include factors of the other bases, and it is necessary to address all factors related to one’s health. I have been amazed at the impact NET has had on my patients. It provides me with yet another tool to help you achieve a state of wellness. Please call our office today (724-934-3911) to schedule an appointment and begin to heal on a higher level.